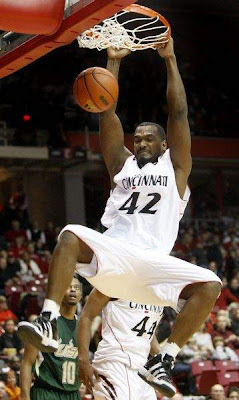 The Cincinnati Bearcats added their 13th win to 6 losses and 4th win against 3 Big East losses in a win over South Florida (11-7 1-5) Wednesday night. Bearcat star Lance Stephenson injured an ankle in practice and was held out. News didn't break until before tip off. The man who started in his place was Jaquon Paker, and he took advantage. Though he didn't lead UC in scoring, Deonta Vaughn had 20, Parker had 15-4-5 assists. Rashad Bishop helped fill the Stephenson void with 15. Steve Toyloy (pictured) had a solid 9-8. For the Bulls, Dominique Jones lead the way with 21-6-4. Chris Howard and Jarrid Famous both had solid games. Howard had 16-9, and Famous 14-7-2 blocks. The Bearcats shot 56% for the night, and held the Bulls to 44%. The teams seemed to swap runs. UC would have a 9-0 run, and the Bulls would counter with a 7-0 run. But, at about the 4 minute mark after USF cut the lead to 5, UC would go on a 6 point run to seal the deal. Nice win for the Cats. More tomorrow.